Home / News / EHF / IN MIKLER WE TRUST: Veszprem tight win in Brest! Roland Mikler is a hero of Telekom Veszprem. The 34-years old goalkeeper of Hungarian vice-champions saved last 7-meter throw in the last second of the match by Meshkov Brest right wing Darko Djukic to ensure second win of his team in EHF Champions League, the starting one after departure of Ljubomir Vranjes. Telekom Veszprem had attack in the last 30 seconds, but Petar Nenadic got a red-card after his shot when he picked up ball. Portuguese referees decided to sent him off and gave chance to home team to score equalizer from 7-meter throw. At the end, 29:28 for Hungarians. 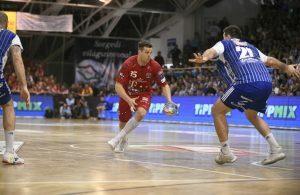 The TOP scorer in the winning team was Manuel Strlek with six goals, while one less netted Darko Djukic for the team of Spanish coach Manolo Cadenas.